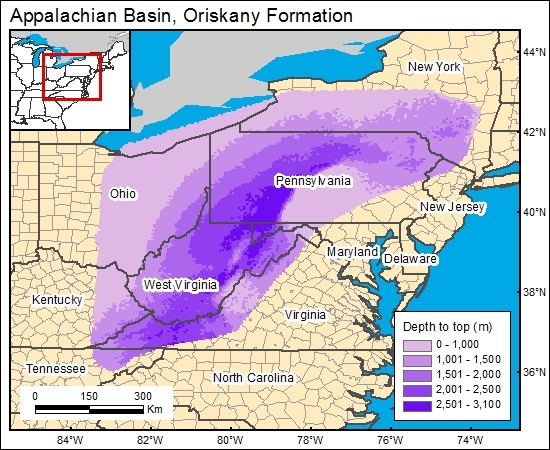 A number of maps show the depth to top of the Oriskany Sandstone, including Diecchio and others (1984) and Harper and Patchen (1996), Opritza (1996), and Patchen and Harper (1996). Only Diecchio and others (1984) provided a regional structural contour map on top of the Oriskany Sandstone, and therefore it was used for the GIS. We then used a DEM generated from Digital Terrain Elevation Data (National Imagery and Mapping Agency, 2000) to calculate and grid the depth to top of the Oriskany Sandstone (c1oriskanyg). Opritza, S. T., 1996, Play Dop: the Lower Devonian Oriskany Sandstone updip permeability pinchout, in Roen, J. B., and Walker, B. J., eds., The atlas of major Appalachian gas plays: West Virginia Geological and Economic Survey Publication V-25, p. 126-129. Patchen, D. G., and Harper, J. A., 1996, Play Doc: the Lower Devonian Oriskany Sandstone combination traps play, in Roen, J. B., and Walker, B. J., eds., The atlas of major Appalachian gas plays: West Virginia Geological and Economic Survey Publication V-25, p. 118-125.